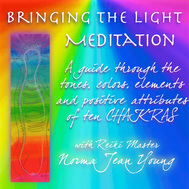 Opening the expanded 10 Chakras with color and sound filling the body - coordinating with the particular element of the chakra. This powerful work opens and tunes you up, filling you with positive qualities, such as initiative, vitality, coordination, calm presence, emotional confidence, motivation, inspiration, eroticism, etc. A full color, water-color chart is also available.